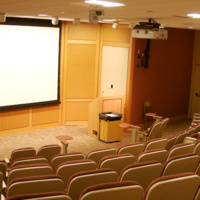 One of the two auditoriums used primarily for medical school lectures, the Estabrook Lecture Hall offers a traditional auditorium atmosphere with seating for up to 125 persons. A-250 can be used for a variety of purposes including lectures, panels, and large-scale video conferencing. Furniture: Fixed rows, with integrated per-seat desk and power. "Environmental Control of Immunology and CNS Inflammation"